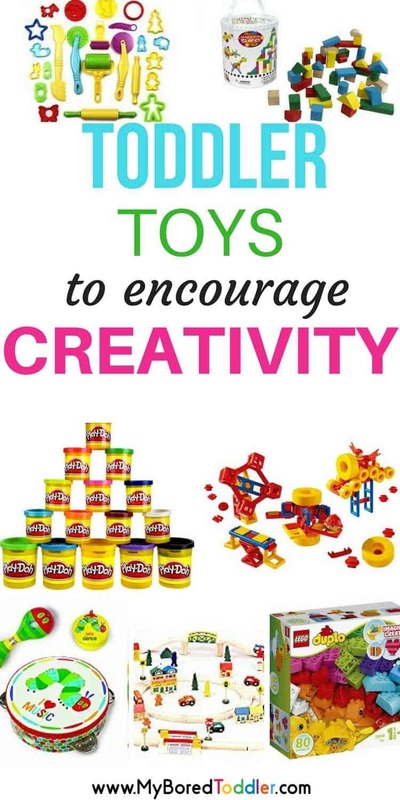 When it comes to the best toddler toys for encouraging creativity, there are definitely plenty to choose from. Educational toy recommendations are one of the questions that comes up frequently in our Facebook Group and it seemed like a great idea to share my favorites with you all here. I’m not against buying toys for my children – you only have to look around our house to know that there are plenty of toys everywhere (do they multiply at night? I’m sure they do!). However, I am against buying one trick toys. You know the ones – they cost around $40, take about 8 batteries, have a very annoying voice singing or talking to you (where do they hire these annoying people?) and your kids get bored with them before all of those batteries ever run out. Over the last few years I have observed the toys that my children play with the most – and it is not the ones mentioned above. I also have an advantage of working in a variety of early education settings, and observing the most played with toys. It’s interesting to see that when children are given ‘free choice’ time, the same types of toys are generally the most popular. Does the toy have more than one use? Will it still be a suitable toy in a years time? Sometimes these toys can seem expensive, but I like to work it out on a ‘cost per play’ situation. 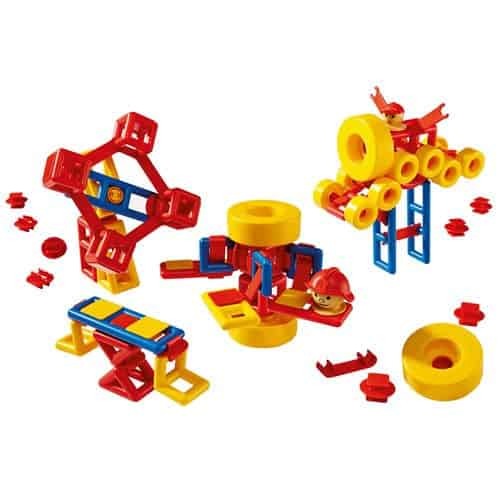 If they play with these toys consistently over a year or two, the cost per play is much less than a cheaper toy that played with a few times and then is never seen again. Play Dough is an activity that can easily be used till long after they start school. A homemade playdough recipe is safe for those younger toddlers who sometimes like to eat it while they play (that’s my child! 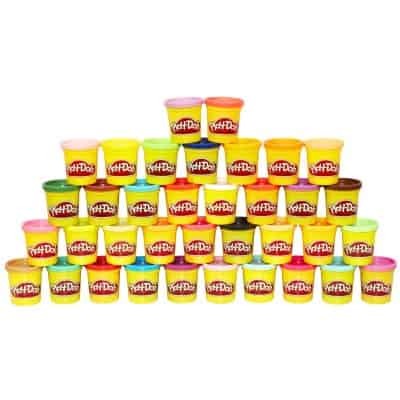 ), or you can buy it for as little as 50c a tub. While you will need to replace the actual play dough occasionally (or make your own like we do). The playdough pack pictured above is available HERE from Amazon. 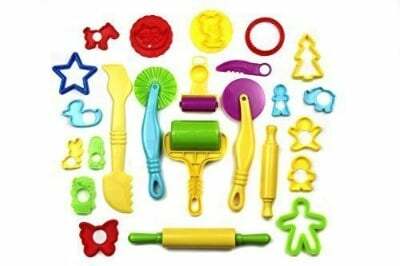 For playdough accessories, you really only need to start with a basic set. The set pictured below allows your toddler to roll, cut, stamp and create and is available HERE. You can always add to the set later. It’s always a good idea to have a mat of some kind for them to play on. I like to use place mats that we keep especially for this kind of activity. When my parents asked my advice about what toys to buy to keep at their house, I could tell they were a bit disappointed when I pointed out the $15 box of wooden blocks. This was their first grandchild and they were happy to spend up big on toys. Two years on and they always comment that those blocks have been the most played with toy they own (and their house is beginning to resemble a toy store!). Some of the blocks even come with a shape sorter on the lid, meaning you get another activity included too. 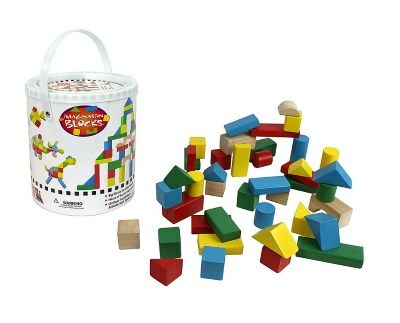 I highly recommend investing in some blocks and these ones are available HERE from Amazon. Mobilo is a toy that I have never seen in a major department store, which would explain why they are generally found in Kindergartens and Pre-Schools rather than at home. This is a shame, as Mobilo is such a wonderful toy for toddlers. You can order Mobilo HERE from Amazon. More Blocks! You really can’t go wrong with blocks, and Duplo or Mega Bloks are the stepping stones to Lego. Who doesn’t love Lego! 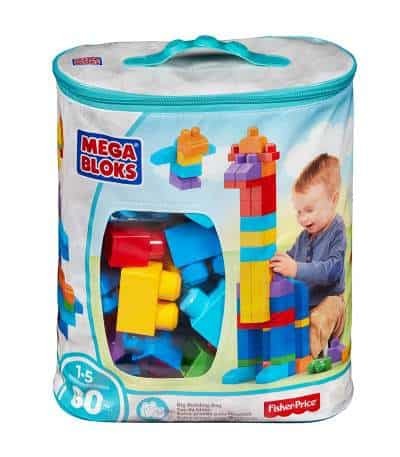 There are so many different sets of these that you can buy now, but I think a basic bag of blocks like the ones pictured above are a great starting point. 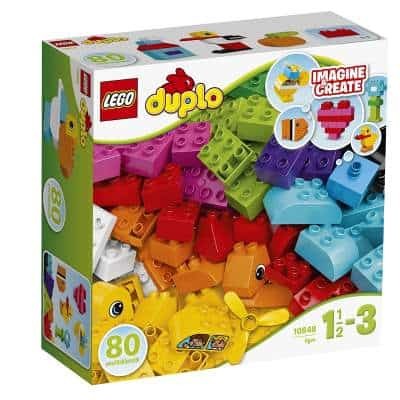 You can buy the Duplo HERE and the MegaBloks HERE from Amazon. My regular readers may be aware that I have a bit of an addiction to buying children’s books (you can see my favourites here). Well, puzzles come a close second! I love puzzles for children, and it is one of my favorite birthday and Christmas gifts for toddlers. There are so many educational benefits to completing puzzles and they really do get used over and over again. 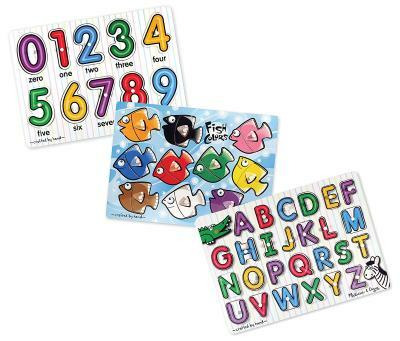 Start with simple peg puzzles and move up as your child progresses. Puzzles are definitely a skill that improves with practice so ignore the ages on the box and follow your child’s lead instead. The Melissa and Doug puzzles pictured above are available HERE from Amazon. 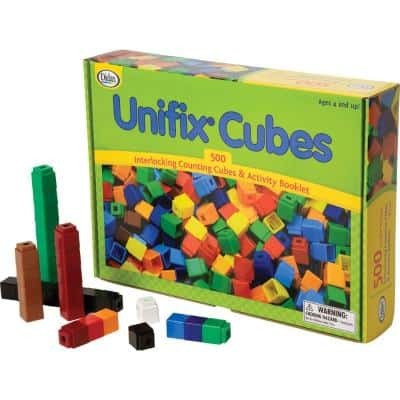 Unifix cubes are another item that are generally found in educational stores but not in the large department stores. There are so many things you can do with these. Build, count, patter, copy, and so much more. These are cheap and definitely worth investing in and are available HERE from Amazon. The Musical Instruments in my house certainly get a good workout, and it is always such a lot of fun when we get them out. They don’t need to be expensive either. While you can spend a lot of money on high quality musical instruments, most toddlers are not going to be particularly gentle with them so I don’t recommend spending a lot. 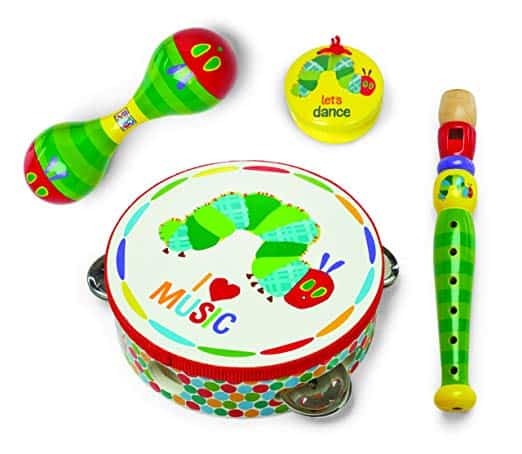 A music pack like the Very Hungry Caterpillar one pictured above can be found for around $20 and is available HERE from Amazon. 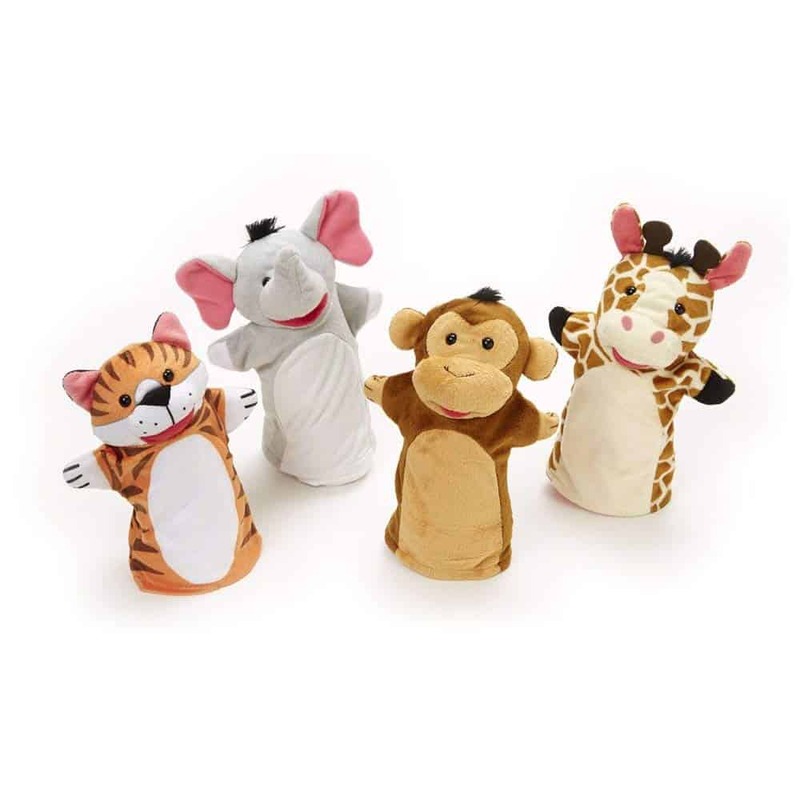 Puppets are fantastic for encouraging pretend play, as well as increasing language skills. Start by being the puppet master, and watch as your toddler will gradually take over and start creating their own stories. You can use these with a puppet theater if you like (or make your own with a few cardboard boxes). We have the zoo animals pictured above, but there are so many different ones available. I love puppets so much that we use them as part of our bath time activities too! The puppets pictured above are available HERE from Amazon. A train or car track is an investment you wont’ regret. It’s something you can always add to and there’s unlimited potential with this toy. Try to get a generic (ie cheaper!) brand so that you can add to it easily. If you’re toddler really loves Thomas the Tank Engine, then check out the cheaper brands (like this one) that can be connected to them. This way you can buy the tracks, trees, houses etc cheaper and still be able to have the official Thomas the Tank Engine trains. The track pictured can be purchased HERE at Amazon. 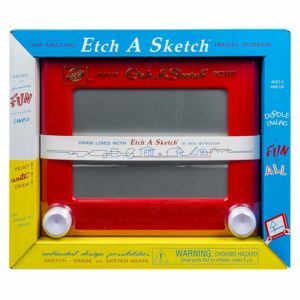 I remember having one of these at home and believe me, they are just as popular now. The one in our house is dragged out almost daily and if often fought over. What I love about this is means you can avoid getting out the crayons and pencils when your toddlers are in the eating them/drawing on the walls with them stage! They now come in color too. You can buy one HERE from Amazon. I’m always asking parents what toys their toddlers love, and a play kitchen is always high up on the list. Boys and girls love it! Some of the newer designs are amazing too – better than my own kitchen! Kitchens and ‘home corners’ in preschools and kindys are always popular too. Don’t limit it to just a kitchen. Add some menus and a nicely set table and it becomes a restaurant or cafe. This kitchen is available HERE from Amazon. Toddlers love to play in the garden so gardening equipment can be used over and over again. There are some very cute kids gardening sets available, and toddlers will LOVE to have their own watering can. My girls love putting on their gloves and using their watering cans when tending to their Wheelbarrow Herb Garden.Available from Amazon. What toys do your toddlers love? Using our ‘cost per play’ method, what would be the best toy that you have in your household? Join our Facebook Group and let us know your thoughts! All of these are great and some of our favorites! Thanks for sharing at our FB Share Day! I have never heard of Mobilo before. It looks interesting, I’m sure my boys would love it. Mobilo is great. We use it all the time in schools and it’s so popular. Ah great ideas. Play dough and building blocks are staples here. I haven’t heard of Unifix or Mobilo – off to investigate! Great ideas! I love the Caterpillar set! On Amazon right now, it is actually less than $9, wow!! My daughter’s nursery is in this theme so we are obsessed with hungry caterpillar toys. 🙂 Thanks for sharing at the Family Joy Linkup! This is a fantastic list and pretty much what we have, too! 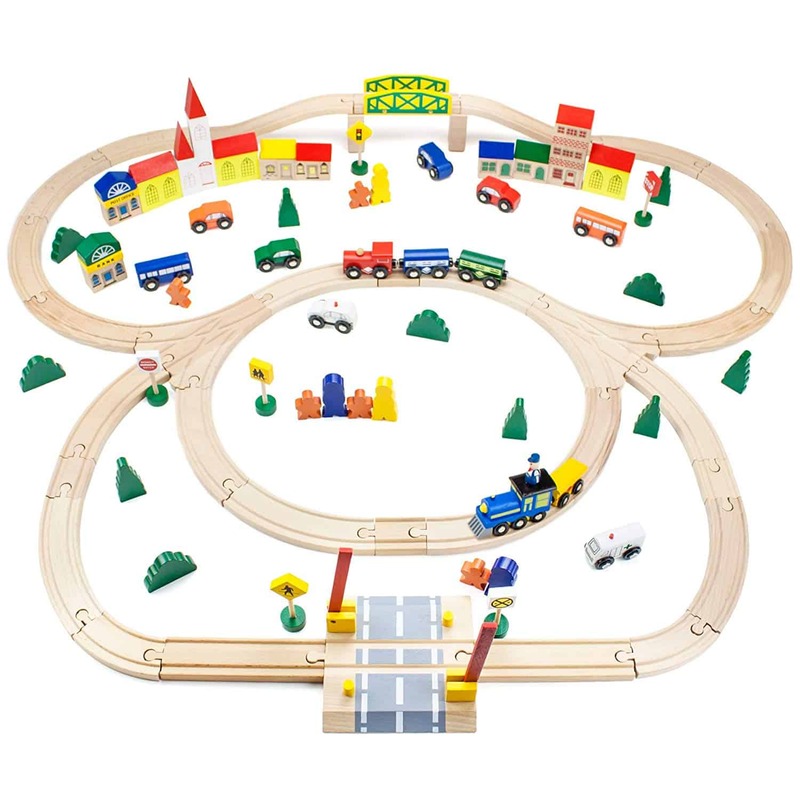 Our favorite is a set of wooden blocks and a train set. You have so many of my faves and many were around and in our house 30 years ago when my kids were young – well, a couple of them weren’t around then! But good old fashioned play is never out of style, is it? Thanks for sharing with us at Throwback Thursday! Great list! We love blocks, puzzles and Legos! Those are tried and true staples in our home. I’m a big fan of anything that encourages creative play. We love costumes and props to be used in make believe…hats, doctor kits, etc. They can use whatever is around the house, but sometimes it’s fun to have a few “life-like” props to get the ball rolling. Nice blog. It’s really important to choose the best toy for toddlers. 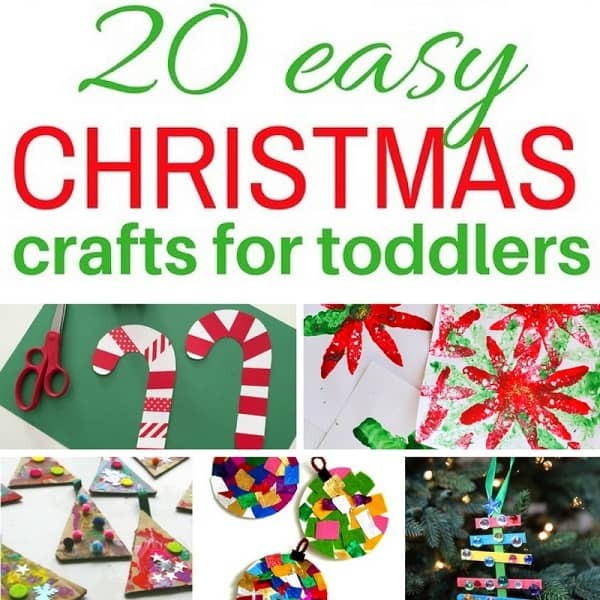 Thanks for sharing best toddler toys to encourage creativity. Toy kitchen is a most favorite play of my kids. I am searching best toy kitchen for my kids. Thanks for sharing the best toy kitchen to help to choose best one for my kids. Pretend play really helpful for kids mental development. I am searching best play kitchen for my little girl. Thanks for sharing such a nice guideline. Awesome list! I love all them, expecially love Wooden Blocks. Thanks for sharing the best play kitchen to choose one for my daughter.